Sprite Shower Filters come in a variety of styles. This guide will help you decide which style is right for you. All Sprite Shower Filters fit all standard US and Canadian showers. 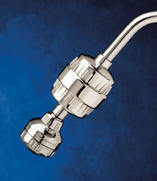 Older shower arms with ball joints require an adapter.